Webkin's World : Happy Adoption Day Shortie! Three years ago today we adopted our dog Shortie from Bath Cats and Dogs Home. I am so glad we found our boy who we love to pieces. Shortie's story isn't a bad one. He was taken into the home as a puppy and was adopted by a lady who had him for 9 years. Then due to personal circumstances she had to give him up. It must have been very hard for the lady to give him up but he was taken back to the home and was in there for less than a week before we saw him. I originally went up to the home to look at a different dog but he wasn't really suitable as my young niece visited me a lot and he wasn't too good with children. So then I went to look at the animals new in and then I saw Shortie. Straight away I knew he was the one. I had a few worries with regards to adopting Shortie. Firstly I was worried about his age. He was nine at the time and I kind of worried how long I would have with him. 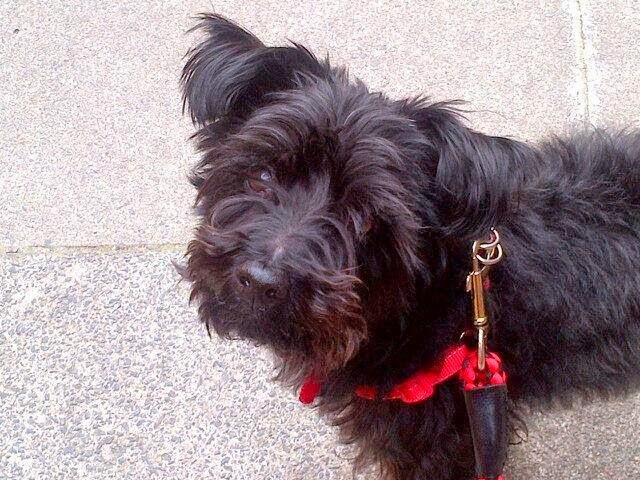 But as he is a Yorkshire Terrier x Poodle he has a longer life expectancy than a pure breed dog. 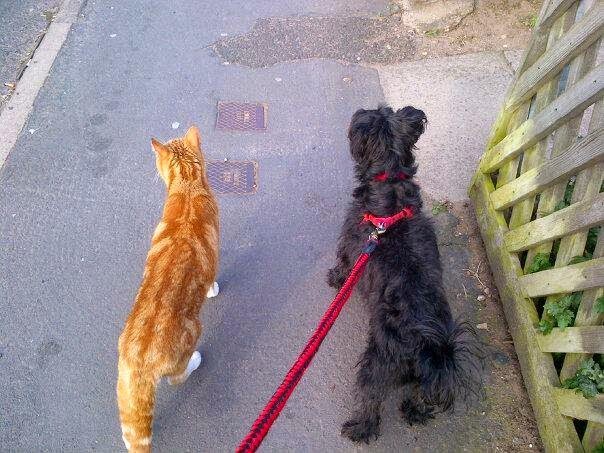 I took him for a walk whilst he was at the home and he could walk and walk. He absolutely loves walking. My other worry was how he would be with my cat Tigger. I knew that Tiggs would be fine with him as he has lived with dogs before and he is so laid back. Luckily it all went fine. 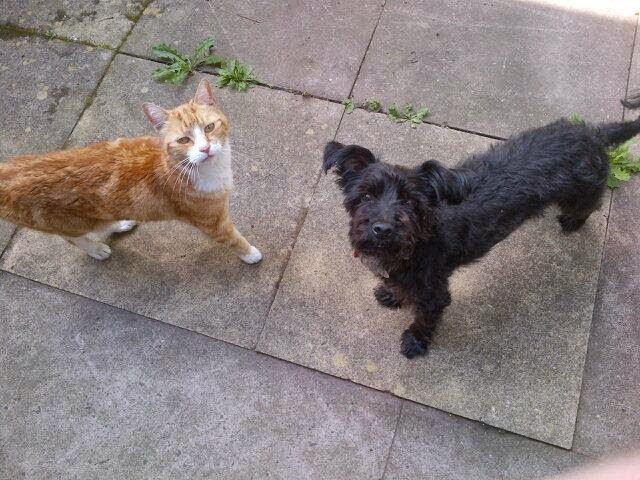 I think Tiggs gave Shortie a little swipe on the day he arrived but within a month they became firm friends. In fact this picture of the boys sleeping together was taken just one month after I adopted Shortie. Shortie settled in well to his new home in Bath and we made new friends at the field near my home. Then we moved to Kidderminster to be with my fiancé Neil. Every day Shortie goes on four walks a day (three short walks and one longer walk usually). Shortie loves life. He is now twelve years old and he still runs around acting a lot younger than his age. He loves walking and being off the lead. He is a good boy. Shortie has also helped me a lot too. For a start he has got me out and about walking which helps keep me going because if I didn't have him to walk I probably would just be totally lazy. He has also helped me meet new friends here in Kidderminster. The lovely thing about owning a dog is you become part of a group of dog owners. It's a great way to start a conversation in the park. We have both made lots of friends this way. 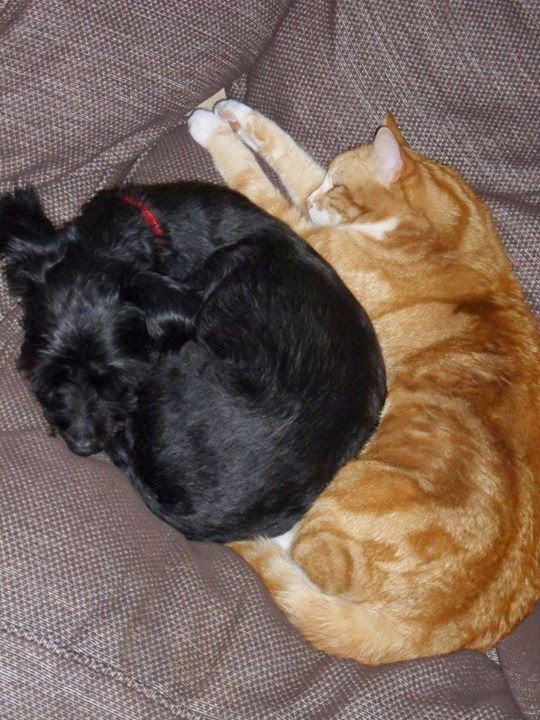 Shortie has many dog friends but he does love his cat brother Tigger a lot too. Tigger comes out for walks around the block with us which a lot of people find very funny. They walk side by side as great buddies. 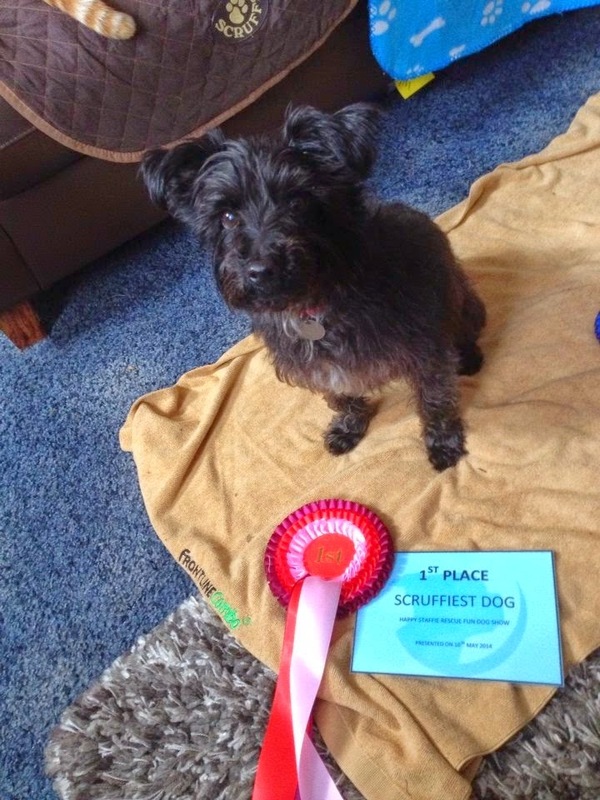 Last summer we took Shortie to two local charity dog shows in our parks here in Kidderminster. He won Scruffiest dog and came second in the Golden Oldie category in the first one and he came second in the Scruffiest dog at the other one. I am so proud of him. Both shows were great fun. One thing for sure is that we totally love Shortie. He is a huge part of our family and he has now found his forever home. I am so so so so glad I found him! Not all dogs are as lucky as Shortie. Some cats and dogs have a long wait to find a new home. Bath Cats and Dogs Home look after the animals very well but all this does come at a cost. A lovely way to donate to the home is by becoming a Paw Pal and sponsoring a long stay animal. I would like you to meet Buster. He has been looked after at Bath Cats and Dogs Home since 2004. 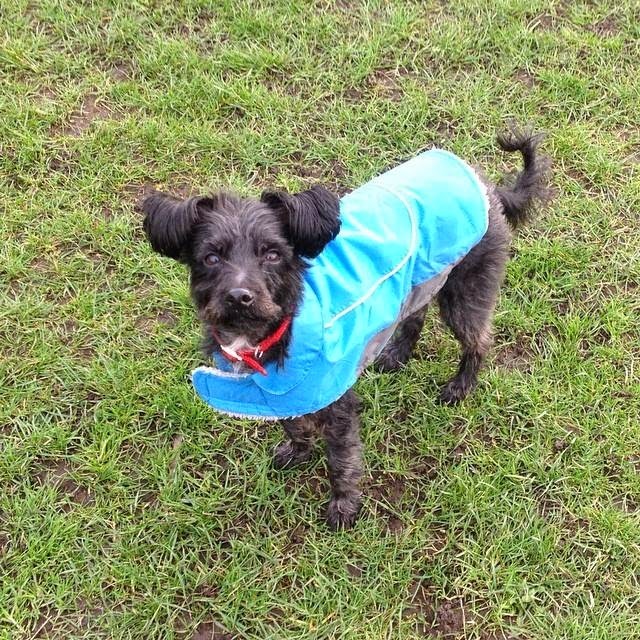 For a minimum of £5 a month you could sponsor Buster towards helping to keep him warm, fed and cared for at the home. 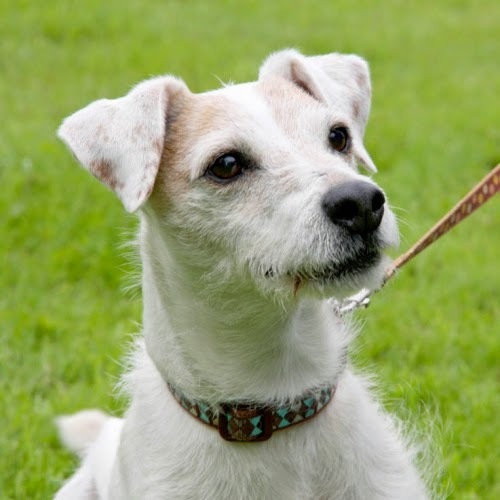 If you would like to sponsor Buster or another long stay animal at Bath Cats and Dogs Home please click here. If you are looking for a cat or dog please consider adopting. There are so many lovely animals out there desperate for their forever homes. I also wouldn't hesitate to adopt a golden oldie again. I can't imagine my life without Shortie now. We are just so lucky to have him. It is really hard going to the kennels to look at them. As soon as you get there you can hear dogs barking. There was an old girl dog there, a collie, she looked so sad. She would have been too big for my flat but I asked about her and she had a reserve on her so I am sure she found a lovely home too. Bath Cats and Dogs Home are good though in that if they know a dog really hates being in the kennels they sometimes invite them into the office or behind the counter. There was a really cute Staffie there behind the reception counter. He seemed happy there getting fussed or sleeping on his bed. Shortie is so cute and I always like reading about you & him on your facebook page, too. I absolutely love the picture of him and your cat Tigger sleeping next to each other, what a team!!! Oh, How gorgeous, I wish people would look at rescue dogs before just going out and buying puppies, so important! Thank you for the article! Shortie is adorable! It much better in my opinion to adopt animals.